There isn’t much that hasn’t been said about Barcelona by literally thousands of journalists over the years. For us it’s a city where we instantly feel at home and comfortable. It’s the Catalan heritage and culture that shapes much of what visitors enjoy about Barcelona. 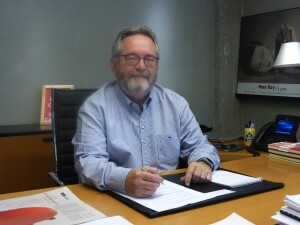 I visited Pere Duran the director general and managing director of Barcelona Tourism. We talked about what makes Barcelona special and the Catalan culture. But then we the interview led to a conversation about dining and that led to lunch just a few doors down from his office. Petite Comite is a sleekly modern restaurant and not one that we would pick as a showcase for traditional Catalan dining but with some help from Pere’s experts dishes magically appeared that demonstrated the complexity of one of the great cuisines in the world. There were familiar flavors of beef and lamb but then a distinct marine flavor appeared. Turns out combining flavors from land and sea is a Catalan signature. And then there were the croquettes for desert. Actually they were little balls of deep fried mystery filled with chocolate. Not croquettes as they are commonly found. Lunch led us to a conversation of tapas and that led us to Bar Velodromo where we took friends that evening. It’s one of the older bars in Barcelona, beautifully restored with a well-worn patina. I was early and had time to look over the huge antique ham slicing machine. No visit to Barcelona would be complete without at least one taste of Iberico, the legendary cured ham of the region. The thinly sliced pieces were an intense deep red, not at like so many hams such as the delicate pink color of the more common Serrano. Eating ham is almost a religious experience in Barcelona and markets display dozens of different types. Iberico isn’t cheap but you just can’t visit the remarkable city without some Iberico. Unfortunately on this trip I was only in the city for one night but I have memories of a lifetime thanks to Pere Duran and our mutual love of great food.